God’s Hammer: The Bible and its Critics by Gordon H. Clark (Unicoi, Tennessee: The Trinity Foundation, 304 pages, 4th Ed., 2011), $5.18. Also available in E-Book format. Chapters include: How May I Know the Bible is Inspired? ; The Bible as Truth; Verbal Inspiration: Yesterday and Today; The Evangelical Theological Society Tomorrow; Special Divine Revelation as Rational; Revealed Religion; Holy Scripture; The Concept of Biblical Authority; Hamilton’s Theory of Language and Inspiration; What is Truth? ; The Reformed Faith and the Westminster Confession. According to the back cover of the fourth edition, “God’s Hammer is a collection of essays on the inspiration, authority, and infallibility of the Bible by one of the greatest defenders of the Christian faith in modern times.” These words, in the opinion of this reviewer, are an accurate summary of the book. doctrines. For the 66 books of the Bible are the very word of God and the only means by which man can come to a saving knowledge of Jesus Christ. Apart from God’s gracious written revelation, we would have no knowledge of creation, the fall, or the atonement. We could never deduce the Trinity or man’s ultimate destination in heaven or hell from our own experiences or by using logic alone. As the cover mentions, this book is a collection of essays by Gordon H. Clark, all dealing with the doctrine of Scripture. The original collection was put together by Dr. John Robbins, who also supplied a short introduction to the work. Each chapter is about twenty pages in length, making for nice bite sized reading. One can easily get through a chapter in a single sitting. But the relative brevity of the chapters ought not lead the reader to suppose this book lacks substance. On the contrary, Clark is a writer capable of packing a great deal of information into s short chapter. In addition to its economy of style and important subject matter, a third strength of this book is that is it succinctly sets forth many of the key ideas and defining characteristics of Clark’s work. For example, in Chapter One, “How May I Know the Bible is Inspired” Clark shows himself to be a careful and logical exegete when he begins his defense of the Bible’s inspiration, not by some long drawn out argument, but by making the obvious and simple point, “The first reason for believing the Bible is inspired is that the Bible claims to be inspired” (p.20). This seems so elementary that it is tempting for the Christian apologist to overlook it. But, as Clark points out, if the Bible did not make this claim, any Christian asserting the divine inspiration of the Scriptures would be guilty of the logical blunder of going beyond the evidence. Later in Chapter One, Clark stops his discussion of inspiration and takes time to define the term. As Clark points out, the Biblical inspiration includes the ideas of plenary inspiration – all the Bible is inspired, not just parts of it – and verbal inspiration – the very words, not just the general ideas, of Scripture are breathed out by God. This is one of the great lessons all Christians can take from Clark: if you don’t define your terms, you don’t know what you’re talking about. Many theologians throw around language without every clearly stating what they mean by the terms they use. Many years ago, this reviewer almost gave up the study of theology for that reason. Christianity is often repudiated on the ground that it is circular: The Bible is authoritative because the Bible authoritatively says so. But this objection applies no more to Christianity than to any philosophic system [e.g. Marxism, Darwinism, Atheism] or even to geometry. Every system of organized propositions [a proposition is the meaning of a declarative sentence] depends of necessity on some indemonstrable premises, and every system must make an attempt to explain how these primary premises come to be accepted (39). Bible is inspired, that it is the Word of God, or that it is true. They begin their thinking with these ideas and reason from them based on the express statements of Scripture and necessary implications drawn from them. Secularists have no basis to object to the Christian’s choice of the Bible as his axiom, for the secularists are in the same boat, they also must chose their axioms, which cannot be proven. The principle difference, therefore, between the Christian and secularists, is not that they have axioms, but what axioms they select as their starting points. Clark wraps up Chapter One with a sound, Biblical explanation of why the Christian starts his thinking with the Bible. In the last analysis, therefore – although historical and archaeological confirmation of the Bible’s accuracy is of great interest to us and of great embarrassment to unbelievers – a conviction that the Bible is really the Word of God cannot be the conclusion of a valid argument based on more clearly evident premises. This conviction if produced by the Holy Spirit himself (43). 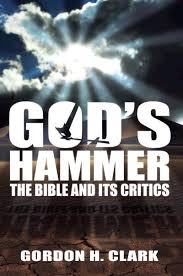 Due to its subject matter and discreet chapters, God’s Hammer is an excellent starting point for the serious Christian to begin his study of Clark. One word of caution for those who have not read a serious theologian before, many of the terms and ideas Clark presents may seem new and hard to understand the first time through. This is perfectly normal. But while with many writers, it is a waste of time attempting to puzzle out what they say – there simply isn’t much in the way of coherent content in their writing to make it worthwhile – such is not the case with Clark. The best approach for a reader new to Clark is to read quickly, get the what he can the first time through (and there is a lot in Clark that is straightforward), then come back later and study in more detail. Clark’s expressions tend to be much clearer the second time around. In short, God’s Hammer is an outstanding defense of the doctrine of Scripture and is highly recommended reading.